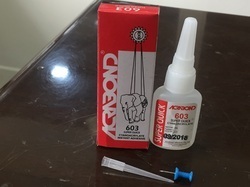 Pioneers in the industry, we offer acrabond high strength instant adhesive-4200, acrabond 4500 high viscosity instant adhesive, acrabond medium viscosity fast setting instant glue acra cyno-4604, acrabond 603 instant adhesive, acrabond-450 instant adhesive-20g bottle and super cement super glue -2g, 3g & 5g alluminium tube from India. 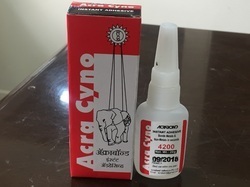 Acrabond Cyno 4200 Adhesive is specially formulated instant adhesive for bonding of special purpose plastics like PBT, FRP, PS etc along with most rubbers, metals and other substrates. 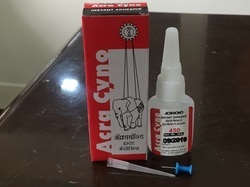 Acrabond Cyno 4500 Adhesive is an instant adhesive having high viscosity, high bond strength and has fast setting properties. Recommended especially for plastics, rubber, ceramics, leather and cork bonding applications. Bonding of similar & dissimilar substrates in seconds, ideal for spot bonding type applications, do not spread the adhesive with spatula or any metallic object as it will bond it in seconds its usage. Selectively used for polypropylene, polyethylene, polytetrafluoroethylene and all non polar materials. Special activator grade AC77 is used for treating these surfaces to secure a strong reliable bond. 20g. HDPE Bottle box packed. 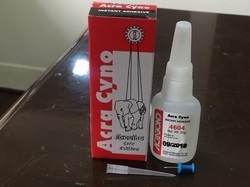 Acrabond Cyno 4604 Adhesive is specially formulated for difficult to bond rubber parts & plastics components predominantly used by AUTOMOBILE COMPONENT manufacturers in their production set-up. It is not sold in retail shops as its an OEM product. Available in 20g HDPE bottle with non-clog nozzle with extension nozzle for ease of application. Acrabond-603 (20g & 50g bottle) is used mainly in plastic furniture manufacturing activity. Plastic doors, windows & furniture industry consumes approx 1lac bottles per month. 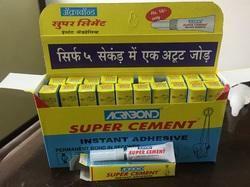 ACRABOND-450 IS A FAST SELLING STANDARD GRADE OF CYNOACRYLATE INSTANT ADHESIVE USED IN INDUSTRIES FOR OEM APPLICATIONS. Looking for Cyanoacrylate Instant Adhesive ?